White as Milk . . .
A new theme has begun to emerge as the Wildflowers of the West Village project unfolds. The recent flowering plants I have discovered and profiled have been very different: one is a vine, one carries its blooms in graceful umbels, but all have reflected variations on the color white. Like a blank sheet of paper, like a cloud, like milk: so white was another variety that began to appear around Manhattan’s west side in September. This plant preferred the shaded edges of green spaces and appeared most frequently along and within hedge rows. The leaves were deep green, ovate in shape, toothed, and ran opposite up smooth stems. The flowers were numerous, compound, and from a distance resembled miniature balls of white yarn. I assumed this wildflower was another immigrant (my more positive term for “invasive”). When a plant becomes ubiquitous in an urban area, it is usually a transplant from abroad. This particular one had popped up in a lot of places with autumn’s arrival and had apparently taken the baton from the Common Nightshade, a European immigrant, which earlier dominated the neighborhood’s tree pits between June and August. My search for a formal name proved to be more difficult than expected. First, I consulted my Invasive Weeds of North America, a laminated folded broadside – “A Pocket Naturalist Guide” – published by Waterford Press. The species are arranged by environment and type, yet none listed made a match. I next turned to my Wildflowers from the Peterson First Guides series. Again, nothing conclusive, although this source revealed the blooms of Boneset, from the daisy family, bore a slight resemblance to the mystery subject. The Boneset’s leaves, arranged in pairs and united around the stem, disqualified it from further consideration. Using Boneset as a base, I dug a little deeper, and at last found my match. The main clue was again related to the color white, in this instance, milk. My search accidently encountered an online essay about a common Nineteenth Century malady called “milk sickness” caused by a wildflower named Tall Boneset or, more commonly, White Snakeroot. Dairy cattle that consumed this plant along the edges of fields would develop symptoms of trembling and vomiting, which were passed on through milk to humans. The source of the disease, long associated with witchcraft, was first pinpointed by a woman, Dr. Anna Hobbs Pierce Bixby. She used deductive reasoning to narrow down potential causes of the illness. She noted that symptoms in cattle and human sufferers appeared in the summer and declined to zero after the first frost. That timing coincided with the growing season. Cattle that grazed on managed fields also tended to be free of the disease. These facts lead her to assume the cause was a wild plant. She next observed what grazing cattle were eating in the field. One unlucky calf was tested with White Snakeroot, and the resulting symptoms, trembling and vomiting, matched those of the disease. Despite Dr. Bixby’s smart solution, the official cause was not listed by the medical community until 1928, nearly seventy years after her death in 1869. This interesting story lead me to type “Tall Boneset” and “White Snakeroot” into the search bar at GOOGLE, and the images that popped up cried out as loud as a “Bingo!” at a county fair: leaves opposite, ovate, and toothed; flowers, held upright on umbels, grouped in tight compound balls consisting of a half dozen or so individual flowers with five pure white petals. 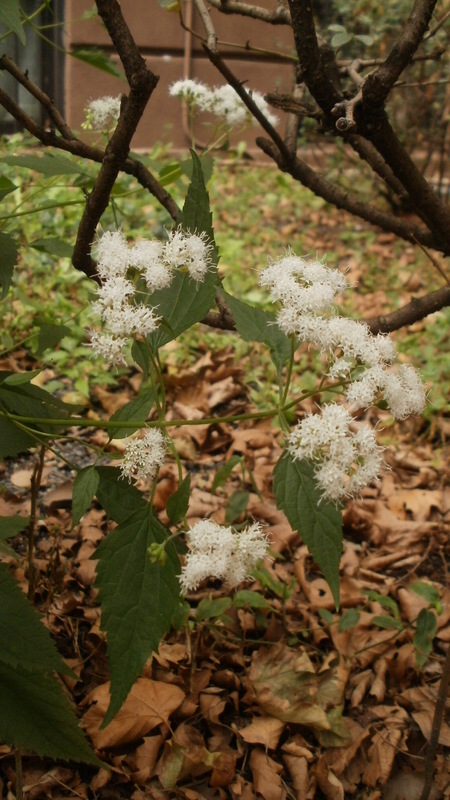 White Snakeroot, Ageratina altissima, is another member of the expansive Asteraceae family, the daisies. The plant is also a native perennial, which explains why I could not find it in my “invasive” field guide. While poisonous and so prevalent as to be sometimes invisible in plain sight, it is also very attractive, especially when viewed up close. 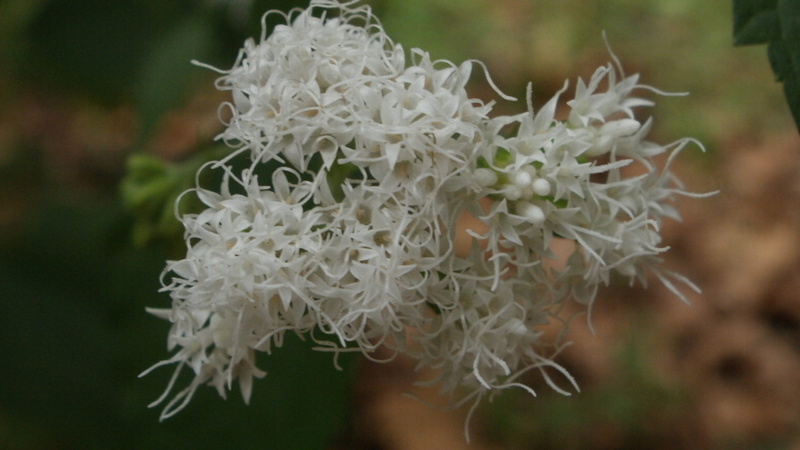 Like so many other Wildflowers of the West Village, the White Snakeroot could be easily integrated into a townhouse garden if tended to carefully and consistently, and if kept away from the pet cow.